This would have to rate as my worst ever road trip... From Whakatane around the East Cape to Gisborne... nothing! Operating the courier service to Wairoa and Napier was Air Napier's Piper Seneca ZK-MSL at Gisborne on 29 November 2013. Is ZK-NAP flying yet??????????? At Hastings - Nothing other than a rather very sad ex Air Chathams Beech Queenair... It deserves to be in the Chatham Island air museum. The Aztecs of Central America were known their worship of the sun. In New Zealand Aztecs have been flying under the banner of the sun as Sunair for over 20 years. The six-seater Piper Aztecs have been used by a surprising number of airlines over the years flying some odd sort of routes. Their small size and yet large cabin have made them a versatile aircraft on lean routes. Today Sunair operate ten Piper Pa23 Aztecs throughout the North Island on scheduled passenger and courier flights and on charter work. At present their scheduled shows flights to Ardmore, Whitianga, Great Barrier Island, Hamilton, Tauranga, Rotorua, Whakatane and Gisborne. Previously Sunair has operated flights to Whangarei, Kerikeri , Auckland, Napier, New Plymouth, Palmerston North and Paraparaumu. They also have an Aztec on lease in Kiribati. ZK-DGS has been used on a number of scheduled airline services. 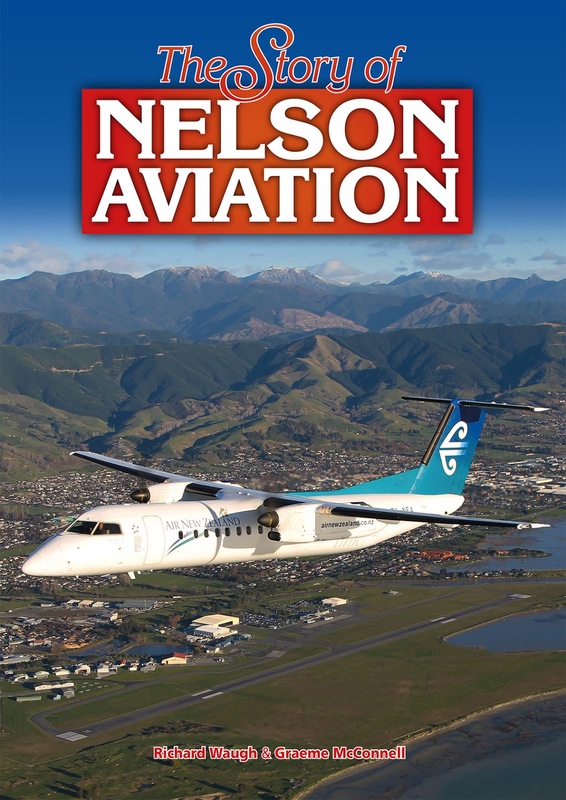 Nationwide Aviation (NP) Ltd operated it between New Plymouth and Auckland, Air Direct operated on flights between Wellington and Blenheim and Wellington and Kaikoura, Pine Air on flights between Tokoroa and Auckland and Air Freight on courier flights from Palmerston North. Sunair acquired it in 2001. It is seen here at Gisborne on 25 November 2011. Sunair's first Aztec, ZK-DIR. Imported from Australia in 1993 it first flew in New Zealand for Air Direct. In 1995 it was sold to Sunair and was used to inaugurate Sunair's flight between Tauranga and Napier on 5 February 1996. The aircraft was offered for sale in October 2017 after the CAA grounding. It is photographed above at Timaru on 1 October 1995 and below at Gisborne on 14 April 2009. Piper Pa23-250 Aztec F ZK-ECM (c/n 27-8154001) was added to the Sunair fleet in December 2012. Photo taken at Tauranga on 14 April 2017. ZK-ERM was first used on scheduled air services with Associated Air. the company began scheduled services from Paraparaumu to Auckland in 1982 and the following year commenced services from Paraparaumu to Nelson and Paraparaumu to Christchurch. ERM was used primarily on these routes. In 1984 ERM was used to establish Motueka Air Services, a subsidary of Associated Air to inaugurate flights between Motueka and Wellington. After use by various other companies ERM was returned to 'airline' work when it was purchased by Sunair in 2001. It is photographed above at Tauranga on the 23rd of January 2002 and below at Whakatane on the 6th of November 2015. Prior to flying for Sunair ZK-EVP was no stranger to flights the East Coast. 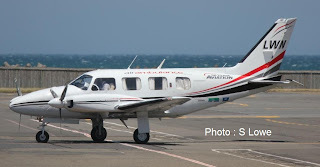 Based in Wairoa with Cookson Air it flew their services to Auckland, Napier and Gisborne. Later Air Freight used it on courier flights to Napier and Gisborne. It is seen above at Napier on 15 April 2009 and below at Gisborne 25 November 2011. ZK-FHO came to Sunair from Takaka Valley Air Services. Previously it had also flown for Air Direct. It was also briefly registered to Flightcorp of Nelson. It was registered to Sunair on the 30th of January 2002. On the 17th of May 2010 FHO suffered a nose wheel failure at Napier after a courier flight from Paraparaumu and it was ultimately cancelled from the register on the 27th of July 2010. Piper Pa23-250 Aztec ZK-MTY was registered on 21 April 2009 after having arrived from Australia. It is seen here at Hamilton on 15 January 2010. Reflecting its previous owner, Mountain Air, ZK-PIW was taken at Hamilton on 23 November 2011. Mountain Air used PIW on their scenic flights from the Chateau and the air service from there to Auckland and from Auckland to Great Barrier Island. It was purchased by Sunair in late 2008. ZK-PIX was first used by Air Nelson on its Motueka-Wellington service before being purchased by Mountain Air. It was sold to Sunair in late 2008 and is seen here at Tauranga taxiing for departure to Great Barrier Island on 18 November 2016. ZK-TDM was imported from Australia in 2003 and has been used by Sunair since that time. It is seen here at Tauranga on 18 November 2016. The most recent Aztec added to Sunair's fleet is ZK-WDP added to the fleet in September 2014. Its registration reflects the owner of Sunair, (William) Dan Power. In 2015 it went to Kiribati where it is on lease to Coral Sun Airways. Photo taken at Tauranga on 5 January 2015. Interested in buying a Piper Navajo? A slightly earlier arrival was Sunair's Piper Aztec ZK-DGS. The Sunair Aztec I was most after, ZK-MTY at Hamilton on 27 November 2013 on the taxi. And over at Tauranga was Sunair's Piper Aztec ZK-EVP. 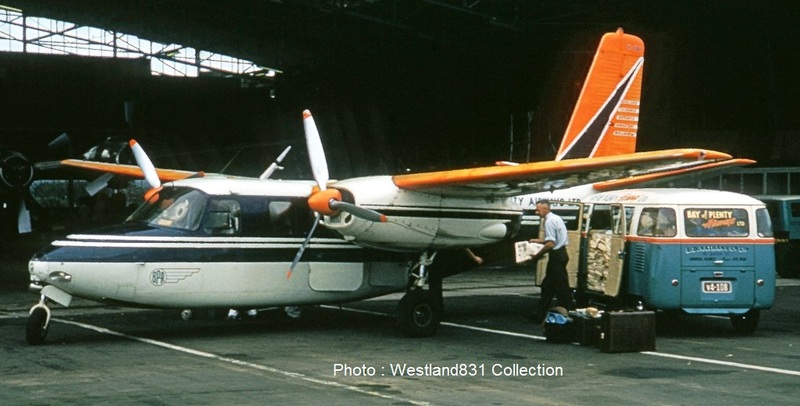 On the 21st of November 1961 Bay of Plenty Airways Aero Commander ZK-BWA crashed on Mt Ruapehu killing the pilot and five passengers while on a flight between Wellington and Tauranga. 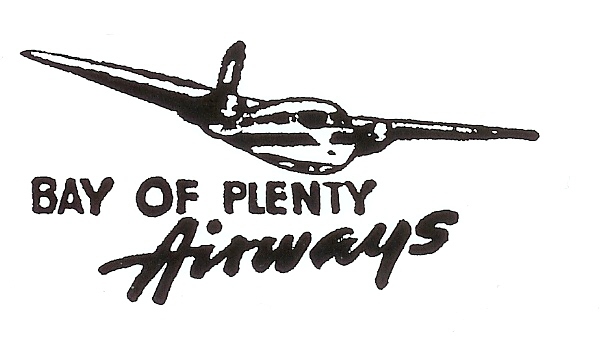 Bay of Plenty Airways was, in my opinion, the first of New Zealand's 'modern' third level airlines. 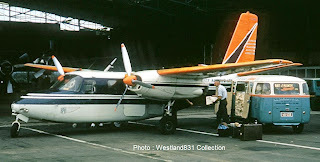 The Aero Commander was New Zealand's first modern third level aircraft and was certainly a big step up from the de Havilland Dominies which had been the norm for third level airlines up until this point. Plans for flights between Wellington and Masterton are up in the air as Wanganui may be getting the plane earmarked for the service. In September, Air New Zealand announced it was axing its Masterton-Auckland route next year, blaming uneconomic operations and lack of demand. The airline is also cutting its flights between Wanganui and Wellington next month. Picton-based Sounds Air has stepped in with bids to provide alternative services for both towns. It proposes to run a 12-seat Cessna Caravan for morning and evening flights from Masterton to Wellington airport for a flat rate of $95 per flight, allowing passengers to transfer onwards. However, the same plane is being offered for the Wanganui-Wellington service. Sounds Air General manager Andrew Crawford said the service from Masterton was still on the cards. "We've been looking at Wanganui and Masterton to see which is going to be better." A decision will be made public next week, he said. Wanganui mayor Annette Main told the Wanganui Chronicle the possibility of a replacement air service for the town was welcome news. "We look forward to Sounds Air's confirmation of the introduction of a service next year." Masterton Mayor Lyn Patterson said at the end of the day, it was up to the airline. "That's the decision Sounds Air will make on a commercial basis." She was not overly concerned if the plane went to Wanganui as she believes the best long-term solution is to have a direct link to Auckland, rather than Wellington. "Ideally the direct link between Masterton and Auckland is what we need to have reinstated. "My preference will always be to have a direct link, that's what has to happen." Wairarapa MP John Hayes has been in talks with other flight providers about filling the gap Air New Zealand would leave. In October, he said he was seeking community support to show potential providers the Auckland-Masterton link was viable. Mr Hayes said the size of some of the providers' planes meant the Masterton airport runway would have to be extended. "We have a number of issues to work through, including whether the present runway will be sufficient for different types of aircraft than those used by Air New Zealand." Mr Hayes said he was looking for a firm understanding of who would use the service, when, and how often at a price of about $300 for a one-way trip to or from Auckland. Sounds Air - sounds good. The aviation company announced on Tuesday it is considering coming here. The Marlborough-based operation is looking to extend its business and flights between Wanganui and Wellington are a natural fit with its operations. It has spare capacity with a fourth Cessna Caravan recently added to its fleet. And the demise of Air New Zealand's flights between here and the capital in December leaves a gaping hole in the departure/arrivals schedule out of Wanganui Airport. Sounds Air has been in existence for 25 years and has an excellent reputation. Any company that has made 100,000 crossings of Cook Strait since its inception in 1986 has to be reliable. A decision has yet to be made - and fingers crossed it will happen. But perhaps we can do a bit more than wish it to happen. At the announcement at the airport all the potential frequent flyers were rounded up to make the company's decision as easy as possible. But anyone else who thinks they would use the service regularly could make their support known. Like most things it will come down to cost and that will be about $125 one way. That sounds pretty good. Mayor Annette Main said when Air New Zealand axed its Wanganui service that it was well known there had been low patronage on the flights due a number of factors, including cost, a less than convenient schedule and improved driving times to Wellington. Two of those things can be improved by another operator. And one thing Sounds Air did make clear on Tuesday - it will operate a service that runs with two passengers per flight or a planeload in its 13-seater aircraft. That kind of integrity will make users here feel much better about backing such an operation. 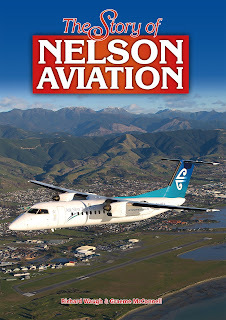 At last - Richard Waugh and Graeme McConnell's long awaited book, The Story of Nelson Aviation, is about to be published. 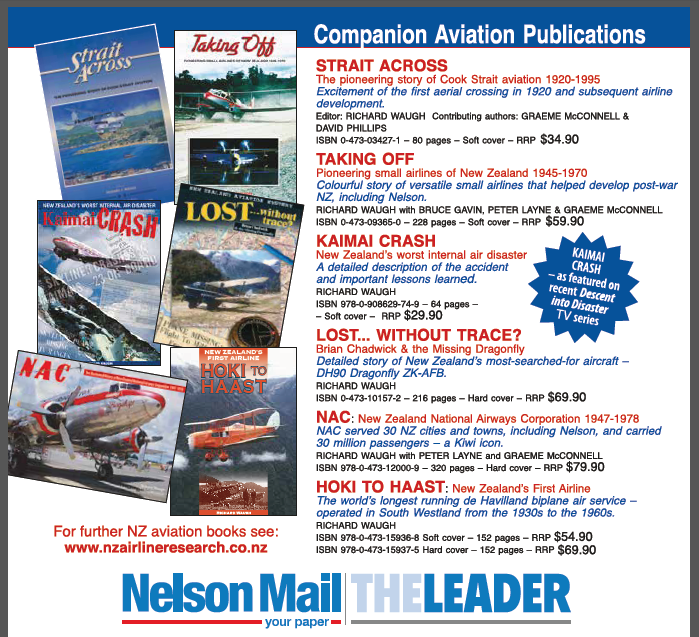 The book, one of the largest NZ aviation publications for many years, will be launched on the 75th anniversary day of Nelson Airport, Saturday the 30th of November. The book is A4 size, has 336 pages, over 220,000 words and 500 photographs and illustrations (the majority in colour). 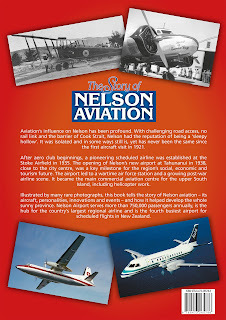 The book covers the entire Nelson region and includes all aspects of aviation such as airlines, personalities, RNZAF Station Nelson, agricultural flying, key aircraft etc. The airport company is planning an elaborate open day with various aircraft and displays etc. Past similar events have attracted thousands. The book launch will be in the big Air Nelson hangar at about 11am and there will be a formal dinner that night at the Hotel Rutherford. The aero club are having an informal BBQ and drinks on the Friday night at their hangar. All welcome. On the Saturday the Southern DC-3 will be giving joyrides on its last big outing before being permanently withdrawn from service early in the new year.